Christmas drawing near, how to release from work duty and stress to throw into a real greeting season? You must be busy with a new-year plan for a bigger performance. You must be still concern about who is your top salesman, which market is your most earning yield? And which department needs to employ what kind of employee? The annual discounts for almost all kinds of goods also come on the busy season. Desktop BI software can help you solve the above questions easily and quickly. Raqsoft should be noticed by up to 50% off on its powerful desktop BI software, esProc and esCalc. Customers who plan for great shopping can’t miss this once-in-a-life-time opportunity before Jan. 20, 2013. Christmas is an important festival in many countries. In order to add extra joy and value to this festival as well as extend appreciation to users worldwide for their continuous support, Raqsoft offers Christmas special offer by providing outstanding desktop BI software with big discounts. Discounts are given according to quantity and different users. Regular users can enjoy up to 50% off on purchasing esProc or esCalc, including 10% discounts and 40% cash refund. For users who buy Raqsoft desktop BI software for the first time can enjoy up to 20% off, consisting of 10% discount plus 10% cash refund. 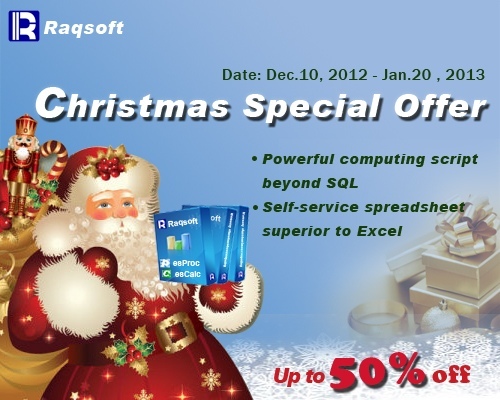 Users can get access to this Christmas promotion campaign can read detailed information on Raqsoft official website. This year’s Christmas has great significance to Raqsoft and is also supposed to be more memorable for users. 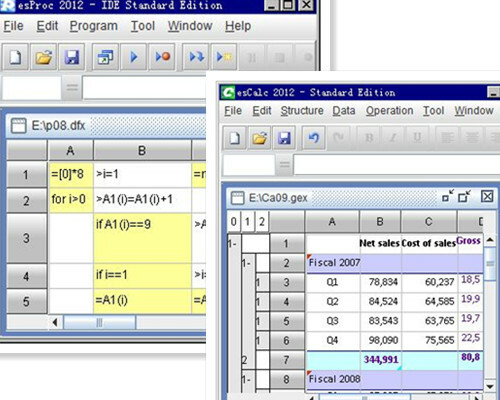 Because it is the first time that Raqsoft gives such great discounts on esProc and esCalc, the new generation desktop BI software for business data computing and analytics in the international market during festival holiday. With 12 years’ development, Raqsoft has been widely recognized by Chinese customers. Its products greatly enhance customers’ work efficiency with ease of use and powerful computing capability without modeling. On the occasion of Christmas, Raqsoft also wants to maximize overseas users’ benefits by offering great discounts on its creative desktop BI tool and smart business spreadsheet software. esProc and esCalc can be free downloaded at Raqsoft official website or download websites. Besides, Christmas special offer is only valid before January 20, 2013. Users can get discounted products at Raqsoft Buy Now page.